Reviews of the Canon PowerShot SX260 HS from around the web. The Canon PowerShot SX260 HS delivers an impressive 20x zoom ratio and very good image quality in a compact package. Integrated GPS is a boon for geotaggers, but the camera's video prowess and high ISO performance aren't best in class. 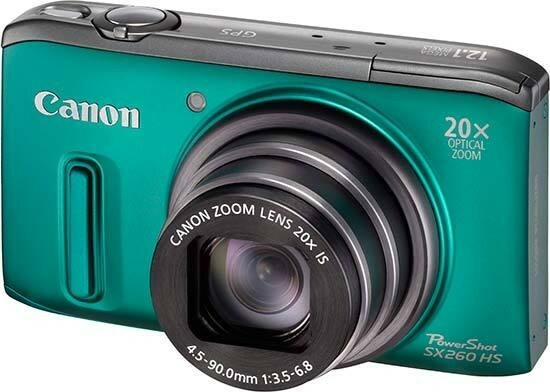 The PowerShot SX260 HS ($349) is the latest compact travel zoom from Canon. The SX260 replaces the SX230 (one of my favorite travel zooms from last year) and its biggest feature is its wider, more powerful zoom lens. Other things that have been improved include its image processor, image stabilization system, Smart Auto mode, and burst mode performance. The SX260 retains the same 12.1 Megapixel CMOS sensor, 3-inch LCD, GPS receiver, and Full HD movie mode of its predecessor. The Canon PowerShot SX260 HS wears many hats: it has built-in GPS, zooms all the way to 20x, shoots 1080p video, and it’s all crammed in a point-and-shoot body. That’s a lot of ground for one camera to cover, and it does a decent job in all areas. Unfortunately, it also suffers from what can happen when you spread yourself too thin – instead of excelling in one area, you find yourself doing OK at lots of things.